Start "Run Experiment" from menu by clicking the link. Maybe here will be short delay caused by the connection to the server and loading. Then you will see the interactive control panel with self-explaining controls ( see the Fig. 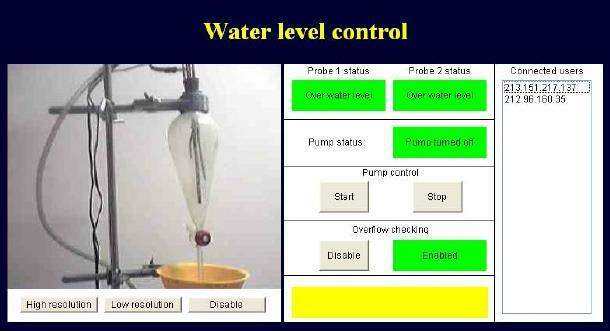 3), by means of which you may control the experiment - "Pump control" "Start-Stop" and "Overflow checking" "Enable-Disable". The messages "Probe 1 status " and "Probe 2 status" signals the height of the water level on probes 1 and probe 2, respectively, and the "Pump status" indicates if the pumping device is On or Off. Maybe you will see the delay between report of "Pump in operation" and the increase of water on Web Camera caused by the speed of web connection. You can switch Off “Overflow checking” and water will overflow the vessel. Don't worry, we took measures not to cause any flooding in the laboratory; it is popular among our visitors. Even if you let the pumping device on intentionally, the demonstration will be turned off automatically after 5 minutes expires. More experimentators may be connected to this demonstration at a time but only one may be at the controls - you can see their IP addresses in the field "Connected users". 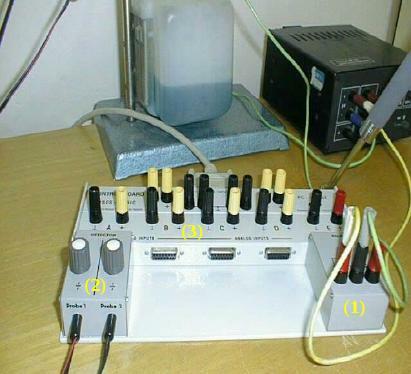 The PC oriented experiment is set up using the modules of ISES relay (1) for pump controlling and probes (2) for water level measuring (see Fig. 4). The modules are operated using the ISES panel (3) and the server. The client (you) connection to the remote experiment is realized through any web browser (MS Internet Explorer, Firefox, Opera, Netscape,..), with the Java support. Java must be installed (free download from www.java.com) and active. For direct access we use port 80 and port 8899. For non-direct access (in other remote laboratory tasks) we use port 80, which is open for all clients. Connection to the remote demonstration is accomplished through any web browser (MS Internet Explorer, Firefox, Opera, Netscape,..), which enables Java support. Java must be installed (free download from www.java.com) and active. The server (we created it for you) is running on a computer PC (e.g. Pentium 4, AMD or even worse) with operating system Windows-98-ME-2000-XP-Vista. On this computer is running web server (typically Apache or Windows web server, the web server choice is not critical). Moreover we run also “Measure Server” (for measuring) a “Image Server” (for video streaming). More details about the software kit ISES WEB Control on our web site.